Apart from the not unimportant matter of what happens at Twickenham tomorrow, the main event of the weekend will be the election to the Catalan Parliament on Sunday. As well as being the most significant election for Catalunya since the death of Franco, it should also prove to be very significant for those of us who want to see other stateless nations such as Wales gain our independence within a European framework. I'm very conscious that I haven't written much on this subject, or on much else, over the past few months. But this is worth carving out some time for. If you want to be reminded about what I've written in the past, please click here, but this is a brief outline of what has happened recently. In essence, the Spanish Government has steadfastly refused to consider any moves towards an independence vote—or even greater autonomy within the Spanish State—even though a clear majority of the people of Catalonia and their representatives in the Catalan Parliament want such a vote to be held. Because of this, the parties which want independence, Convergència Democràtica de Catalunya (CDC), Esquerra Republicana de Catalunya (ERC) and Candidatura d'Unitat Popular (CUP), have called an early vote which they intend to be a plebiscite on the sole question of independence. The CDC split with Unió Democràtica de Catalunya (UDC) with whom they had shared a long-standing and largely successful coalition, over the issue. There were hopes in some quarters that the pro-independence parties would form a single electoral list, in which politicians would play a secondary role to prominent non-political figures in Catalan society so as to emphasize that this was a matter that transcended normal party politics. After much negotiation this was largely achieved, with only one pro-independence party, the smaller CUP, refusing to join it. This list is Junts pel Sí (JxSí, Together for Yes). So there are two voting options which are unequivocally pro-independence and, if these candidates win a majority of seats in the parliament on Sunday, their declared aim is to unilaterally declare Catalunya as an independent republic within 18 months. A second cross-party electoral list, Catalunya Sí que es Pot (CSQEP, Catalunya: Yes We Can) has been formed by parties which support the Catalan right to democratic self-determination, but still believe there is room for negotiation with the Spanish Government either for a binding official referendum on independence, or for greater autonomy for Catalunya within the Spanish State. The three main parties in this electoral list are the Green ICV, the leftist EUiA and the anti-austerity Podemos. Within this group, and even within the parties, there are shades of opinion about the preferred end-result: some want independence (but after a referendum rather than a unilateral declaration of independence) while others want Catalunya to be a state within a federal or confederal Spain. There are four other main parties standing on their own rather than on joint electoral lists. The Partido Popular (PP) and Ciutadans (Cs) are implacably opposed to any change to the status quo. The Socialist Party of Catalonia (PSC-PSOE) probably is too, although it has in the past paid lip service to the idea of a more federal Spain. The problem is that those in the party that do not want to retain the status quo have now all left it. Finally the UDC, the CDC's former partners in CiU, are standing, but have paid a high price for the split and have all but fallen off the political map. After our recent experience of opinion polling in the run up to this year's Westminster election, we might well take the polls for this election with a pinch of salt ... but what else do we have to go on? 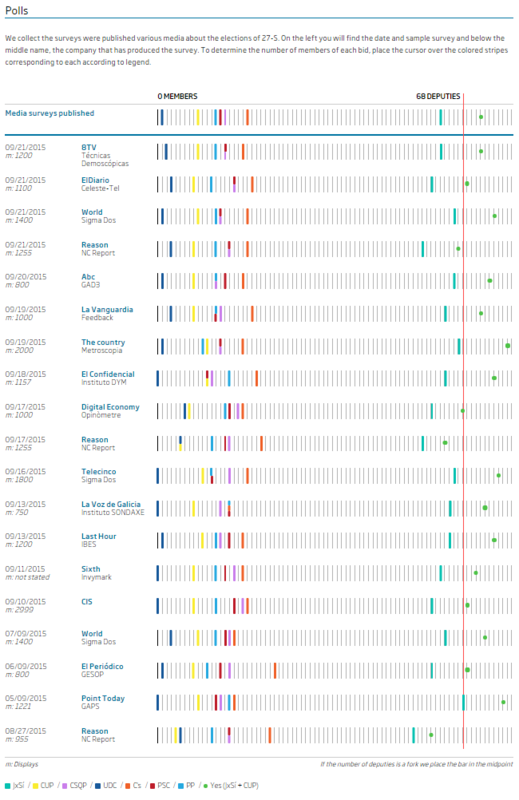 The graphic above is from Ara, and shows the results of a plethora of polls taken over the last few weeks. Nearly all of them show that Junts pel Sí and CUP will, together, get over the threshold of 68 seats and win an absolute majority in the Catalan Parliament. I, too, am fairly certain that this will happen. So far as I can judge from this distance, the momentum is with the pro-independence movement. As it's no fun to write without making a prediction, I reckon Junts pel Sí will get 65 seats and CUP will get 11, giving them 76 seats in a parliament of 135. This, in itself, would undoubtedly be a mandate for independence. But there are a couple of other factors which need to be addressed. The first is whether Junts pel Sí and CUP will get more than 50% of the vote between them. The electoral system is proportional (D'Hondt) with separate lists for each of the four provinces (Barcelona, Girona, Lleida and Tarragona) and a threshold of 3%. These two factors tend to favour larger parties, so that is it quite possible to get a majority of seats with, say, only 45% of the vote. This is, of course, far better than the scandal of the Conservatives winning a majority of 331 out of 650 seats in May under our first-past-the-post system with less than 37% of the vote ... but there are bound to be some people who will claim that the pro-independence parties have no mandate to declare independence if they get an absolute majority of seats, but fall short of 50% of the vote. This graphic from a poll in El Confidencial shows how a result very similar to the one I expect might result in a comfortable majority of seats, but still fall marginally below a 50% share of the vote. I hope that this doesn't happen, and that Junts pel Sí and CUP will get more than 50% of the vote. But even if they fall short, it won't invalidate the independence mandate. As I explained before, those who vote for Junts pel Sí and CUP want independence and are prepared to see a unilateral declaration of independence, irrespective of the wishes of the Spanish Government. But there will be others who nonetheless still support independence, but would prefer to get it with the consent of the Spanish Government after a referendum. These people will (in all probability) vote for Catalunya Sí que es Pot, and there is every indication that CSQEP will get at least 10% of the vote. Of course not everyone who votes CSQEP on Sunday will want independence: some of them (perhaps most) might prefer greater autonomy in a federal or confederal Spain; but some will want independence, and this would be enough to push the total figure over the 50% mark. Those who are opposed to Catalan independence can't have it both ways at the same time. They cannot point to a majority of seats but a shortfall in the popular vote as something which invalidates any mandate for independence; for they wouldn't accept that a majority of the popular vote was a mandate anyway, and the simple way of answering that question would have been to allow a binding referendum in the first place. A second objection would be to point to the fact that support for independence is not evenly split within Catalunya. 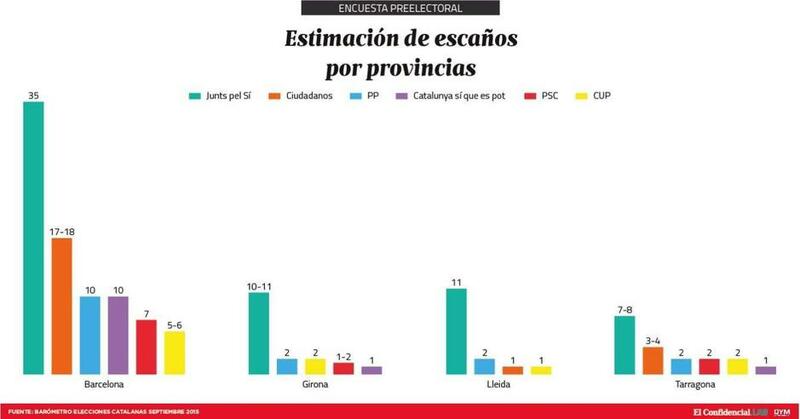 The graphic above is from the same poll in El Confidencial, and illustrates that support for independence is much stronger in the provinces of Girona and Lleida than in Barcelona and Tarragona. This, coupled with the fact that Barcelona has 73% of the population but only 63% of the seats, means that we are likely to hear complaints about the mandate not being valid because Barcelona has not been carried. Those who are against independence will clutch at anything to claim that the result is invalid. I'm just trying to anticipate the sorts of objections that will be raised. Suffice to say, things will be very much easier if Junts pel Sí and CUP get more than 50% of the vote. I'll put my neck on the block and say that they will ... but that it will be rather too close for comfort. The next question is what will happen after the result is announced. Probably not much. There will not be an immediate declaration of independence. Instead, the leaders of the new pro-independence government will again try and negotiate with the Spanish Government, who will loudly reject their approach. The ruling PP (and PSOE) are far too preoccupied with the upcoming Spanish election scheduled for December this year to make any concessions. It would be seen as being "soft" on the Catalans, and therefore cost them Spanish votes. One thing is sure, the Spanish public want to hold on to Catalunya as part of Spain; mainly because they believe it, and its wealth, "belongs" to them, and because they don't want to see themselves demoted from their current position as one of the big players in Europe. So any meaningful negotiations with Madrid will only happen, if they happen at all, when the composition of the next Spanish Government is known. In my opinion, the only hope for any sort of accommodation will be if Podemos can form a government or hold the balance of power. The traditional two party dominance of the PP and PSOE has been challenged by the rise of Podemos and the Ciudadanos. For a time it looked likely that Podemos would eclipse them both, but they have fallen back over the past few months. I don't follow Spanish politics as closely as Catalan or Basque politics, but right now it looks as if the outcome will either be a broadly right coalition between PP and the Cs, or a broadly left coalition between PSOE and Podemos. If it is the second, there might well be some room for negotiation about a new constitution for Spain with greater autonomy for Catalunya, and Podemos (who accept that Catalans have the right to determine their own future, even though they'd prefer them to stay) might just be able to deliver a referendum. However I suspect it's all too late for that now. The real negotiations are likely to take place at a European level. The EU is renowned for sitting on the fence, and I'm sure it will continue to hold that position until forced to get off it ... in public, anyway. But in private, not even the EU would be stupid enough to ignore a newly elected pro-independence Catalan Government which says, "We have now been given a democratic mandate to declare independence, and we are going to act on it. So let's spend the next 18 months negotiating Catalunya's relationship with the EU so that the transition is as smooth as possible for all concerned." That's why this election is important not only to Catalunya, but to other stateless nations in the EU. Whatever accommodation is made for Catalunya is likely to form the basis of the way things will work for the Basque Country, Flanders, Scotland and, of course, Wales. I don't for one moment think that the EU will go out of their way to make it easy for the Catalans, in fact we could say that they have done everything they can to dissuade them from voting for independence by not giving clear answers to those questions before now. But a democratic decision will be made on Sunday and, once it has been made, it will be in no-one's interest to make it hard for them either. Pragmatism will prevail. One great, narrow win for Wales today. Now looking for a great, narrow win for Catalunya tomorrow. Turnout is higher than normal. At 13:00 it was up 5.5% compared with 2012. Hard to imagine things changing much now. If anything, the pro-UDI percentage will increase very slightly because the last areas to be counted are less urban, but won't get past 50%.